If you like to hike and camp and generally commune with nature, then many of your beginner photos will be pictures of the outdoors. 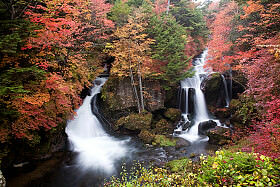 Waterfalls are some of the most popular and spectacular natural subjects to photograph. For many beginner photographers, the blurred-water shot of a river, stream or waterfall is an ultimate goal. You can either create that blurring effect, giving your still photograph movement or a dynamic quality, or freeze the motion. You’ll capture the beauty of waterfalls, frozen in time or seeming to move with it, once you learn a few of the secrets of taking pictures of moving water. 1. Equipped for the Challenge. Other than your camera and lens, you’ll definitely need a tripod. To capture the motion of the water, you must shoot at a very slow shutter speed, which means the camera must not move. You couldn’t hold it steady enough without blurring the entire photo. A polarizing filter and neutral density filter for each lens would also be helpful, but not absolutely necessary. 2. Take a Reference Photo. Once you’ve framed your waterfall photo, shoot a test photo, with your camera in auto mode. The test will probably freeze the flow of the water. Remember the exposure setting the camera automatically chose. Now that you know what exposure freezes the water, you can experiment with settings on either side of that point. 3. Use the Shutter Priority Mode. • Instead of photographing a waterfall during the brightest time of the day in full sunlight, shoot at sunrise or sunset, or on cloudy days. • If your digital camera accepts filters, then try a polarizing or neutral density filter. Both filters work much the same as polarized sunglasses: less reflection and less light enter your camera, so you can shoot at slower shutter speeds. • Another solution is using the aperture priority mode. The camera will select the smallest aperture, usually f/22 or f/36, which then causes your camera to choose the longest shutter speed at that aperture setting. That combination should blur the water and correctly expose your picture. • When you set a lower ISO, you also decrease the light sensitivity of your camera’s sensor. The shutter will remain open for a longer period of time, and you’ll receive the added benefit of sharper images. Another professional technique for beginner photographers is to bracket your exposures. This means that you take a series of pictures at the prime exposure setting your camera suggests as well as the next higher and lower group of settings. Beginner photographers tend to shoot only wider photos of a waterfall, so they can capture the entire subject. Those pictures will certainly look great, using many of the techniques in this article; however, think about shooting closer views of the waterfall too. For example, compose a picture of just one section of water. Spend some time to learn the many ways the water flows: twin streams, bouncing over rocks, etc. Think like a pro instead of a beginner photographer: Check the area around the waterfall for litter or other unwanted elements. You don’t want to disturb the natural environment by moving big rocks or fallen trees; they will give your waterfall photos other interesting focal points.